I know I know. Yesterday came and went and I didn’t blog. I have to be honest with you, moving across the country and planning a 25th anniversary event have proven to be the too much in the whole “the good lord never gives you more than you can handle” caveat. I took easter off to pack my life away in boxes and make to-do lists. I missed you, and you should know that I much prefer to chat with you over a glass of wine than pack boxes. To make it up to you, I’ve planned a week. I know we don’t really do much theme-ing over here at Amuse Bouche, but it’s time we gave breakfast it’s proper glory by celebrating BREAKFAST WEEK on the blog. Yes, from sweet to savory, quick to involved, we are covering the full spectrum of breakfast this week. Because I am overwhelmed with my life and half drunk /medicated for the duration of this week, we are easing into this. (that’s a little joke, I start acting like my life is a padded room when I get stressed out). 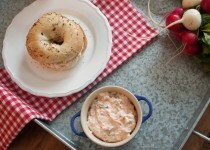 But we really are easing into this, with homemade veggie cream cheese. 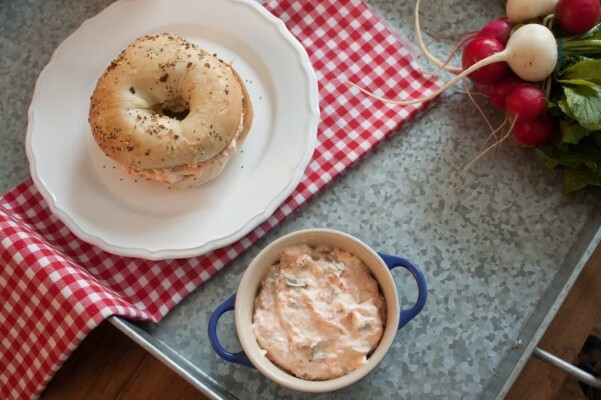 A few fresh ingredients is all that stands between you and a kicked up bagel. Takes 5 minutes, you can do this! mix the grated/diced vegetables in with the cream cheese, and season with salt and pepper. Spread on a bagel, call the authorities on how easy this is. It’s one I carry in my back pocket everywhere I go. I feel even more inclined to tell you this secret after watching last night’s top chef, where it became clear that even some of the greatest minds in the culinary world don’t know it. It’s the very best, most delicious and perfect way to cook a steak. Leave your grill for vegetables, heaven forbid your steak should touch those grates. (Yes, I sure do realize that men across America are either gasping or straight PISSED at me right now. Sorr, kids. Ur dad taught you wrong.) And if you don’t believe me, come to my house and I will prove it. I’ll go head to head with any man in America who thinks they can cook a steak on the grill better than I can in my kitchen. Anyway. The best way, guys, they call it ‘Restaurant Style”. You know when you go to Joe’s Steak and Crab, and it’s the best steak you’ve ever had? NOT GRILLED, SON. It’s pan seared in butter and finished in the oven. 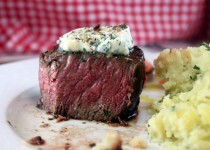 It’s the perfect medium rare and it’s the most flavorful, delish, heavenly dish of all time when done correctly. Also, my apologies to any vegetarians who read this, not because it’s all about meat but I’m mostly sorry that you can’t taste excellence. It also goes without saying that a perfectly cooked filet mignon pairs perfectly with an 08 Hill Family Estate Atlas Peak Cab Sauv. 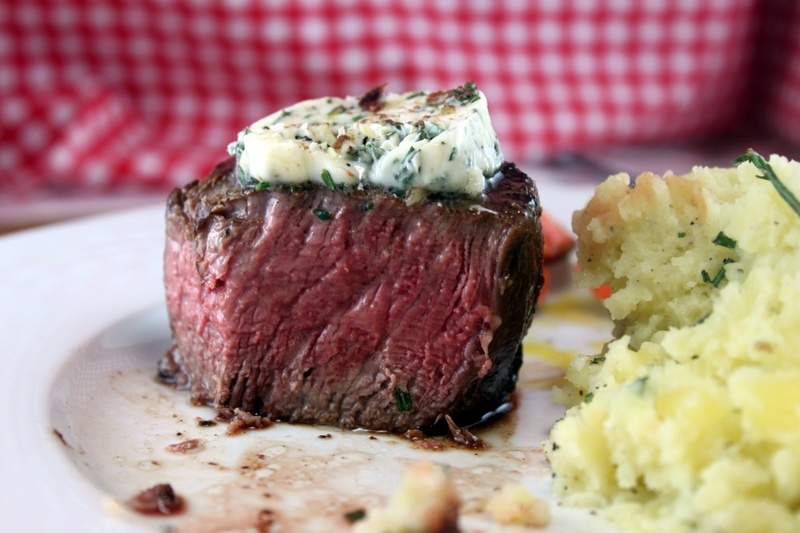 The best steak you’ve put anywhere near your face. And there you have it. It’s as simple as can be, as most the best things in life are. And I dare you to tell me of a better way to eat filet. So, let’s have a conversation about donuts. Doughnuts. Whatever. I don’t really care what you call them. Let’s talk about fried dough. You’ve heard my saying, “You can’t spell friend without fried” and sweet lord is that the truth. Sometimes, there is no alternative to a piping hot, glaze covered, cinnamon smelling ball of hot fried cake, am I right?!? I am embarrassed to tell you, well only a little, as I imagine I am not the only one, that I find myself in awkward silence/swoon moments when it comes to fried ‘nuts. You know, the shortening of the word do-nuts. Fried ‘nuts. Right. It’s all I can do to keep it together sometimes. So what are the 2 things that make it alright to get out of bed in the morning? Clearly, coffee and donuts. Or, coffee glazed donuts. Yes, I went there. Care to follow me? In a medium saucepan, combine the butter, water, sugar, and salt over medium heat. Bring to a boil. Remove the pan from the heat after 10 seconds of boiling and add the flour. Using a wooded spoon, quickly stir the mixture until all the flour is fully incorporated and forms a thick dough. Return the pan to the heat and stir for 2 minutes. Scrape the mixture into a stand mixture fitted with a paddle attachment. Add the eggs and egg yolk, 1 at a time until fully incorporated. Beat the mixture for 4 to 5 minutes until thick and glossy. Add the lemon zest and fridge for 15-30 minutes. For the glaze: In a medium bowl, whisk together recommended: Kahluathe cream, coffee liqueur, and espresso powder until smooth. With a wooden spoon, gradually stir in the powdered sugar until smooth. If the glaze is too thick, stir in the water, 1/4 teaspoon at a time. In a large heavy-bottomed pot, heat over medium heat until a thermometer inserted in the oil reaches 375 degrees F. Drop tablespoon sized scoops of the dough into the oil. Cook for 3 to 3 1/2 minutes, turning occasionally, until the donuts are golden brown. Drain on paper towels. For the glaze, dissolve the esspresso in the water. Add the heavy cream and then the powdered sugar. Stir until the lumps are gone, and dip the donuts in the glaze. Maintaining your swimming pool clean is one of the basic things you can do to enhance its safety regarding bacterial and other wastes that have accumulated over time. Frequent cleaning of swimming pools is done using a detergent known as bleach. The bleach can form hypochlorous acid and combine with water pollutants in the water to offer you the best cleaning approach. The second reason why you should bleach your swimming pool is to increase the concentration of chlorine in the water. Bleaching of the swimming pool can be preferably be done in evenings or early in the morning to avoid degrading the chlorine in the sun. Using bleach will help you to remove urine, micro-bacteria and other contaminations such as lotions, perfumes, and other hair products which make your swimming pool be in a good state for use without having to worry of getting sick and different types of skin irritations. The accurate quantity of bleach used to shock your above ground pools is contingent upon the size of your pool. Bleaching your underground polls need one to increase the quantity of chlorine in water to at least 5 parts per million. As a result, one needs to have gallons of bleach for 10,000 gallons of water in your above ground pools. Obtaining the needed value of bleach for your above ground pools is determined by the size of your pool by the size of your pool. To have the right capacity of bleach for your underground water and to avoid using an excess of the bleach, you are required to establish the exact capacity of your above ground pools. For instance, you can assess the approximate amount of water that above ground pools have by multiplying its length with width. The result should then be multiplied with the average depth of your pool which is 5.9 for most common oval pools and 7.5 for square based above ground pools. To raise the level of chlorine in your above ground pools to 5 pmm, you need to use a maximum of gallon of bleach for every 10000 gallons of pool water. However, to bleach 1000 of pool water, you will require (1000*1/2) /10000 which gives you 0.05 gallons of bleach. There are different cleaner that you can use in cleaning your swimming pools. The most convenience types are robotic pool cleaners. Robotic pool cleaners can be defined as the vacuum maintained bots which have a low voltage power and programmed to help in waste removal from swimming pools without using much of human intervention. Robotic pool cleaner on the market offers you with at the quickest way through which you can clean your above ground pools with more ease and efficiency. The automation makes swimming pool cleaning faster, easier and efficient. The most common type of robotic pool cleaner on the market that you can use to clean your swimming pools include Polaris 9550 Sports Pool Cleaner, Hayward TigerShark, Maytronics Dolphin Triton Plus and Aquabot Breeze IQ among many others. Searching for the best above ground pool on the market is not easy. More so, maintaining its cleanliness with traditional vacuum is never a pleasant task. Leaves falling from trees and all tiny bitsy dirt can cause the water to turn cloudy. Save yourself from long hours of hassle by using robotic pool cleaner for leaves and spicing up your swimming experience by adding solar pool cover to the equation. Filling up a pool with well water will save you an average of 15 hours of possibly wasted time if you use a conventional hose. Water is naturally packed with iron, but well water’s ionic state have dramatically higher iron levels. Over time, the iron level of the water increases even more, turning it into rusty brown, hue or green color. This causes stain not only on the walls, but also on the hair and nails of swimmers. Sprinkle the rusty water with dirt and leaves for a sure disaster you’ll never want to re-experience. This enables swimmers to get the best water pool with a clear vision. For natural pools, the most famous and easy way to treat a pool filled with well water is through chlorine based shock. This treatment could last up to five days and requires high volumes of chlorine. Keep in mind to do this during night time to avoid exposure to UV rays which diminishes its effects. Above ground pools and in ground pools can be sanitized by using pool clarifier which collects small particles and bind them to form large chunks that can be easily filtered. Follow up the process by removing all dirt using a robotic pool cleaner for leaves. Drop and relax with Dolphin Nautilus CC Plus Pool Cleaner for superior cleaning, terminating large debris, leaves, and even the smallest particles along with algae. Once the water is clean, grab a solar pool cover to heat up the water while saving your pool from further evaporation. Unwind in a warm night swimming with help from Sun2Solar Clear 16-Foot-by-32-Foot Rectangle Solar Cover. This will save your pockets from expensive heating cost without dropping the temperature of water during night time. It effectively collects sun heat and prevents 95% water loss due to evaporation. If well water is the only option you have to fill your above ground pool with, it is better to regularly apply metal out products to avoid any problems from recurring. By using these chemicals, any type of metal particles that enters the pool will contain and inactivated. If you’re worried that your pool has a lot of iron, consult pool professionals for water testing and proper guidance for the process of iron removal. Well water is prone to high iron levels and adding metal out products on a regular basis to keep the water fresh to help maintain your pool’s cleanliness. Who doesn’t like to swim? Everyone, either it can be with friends as parties or with family, swimming has been one of the well-known outdoor activity for decades. But, in recent times artificial pool setup has been the alk of the town’. As much as people like to swim on their own apartments or condos or house, people would also like to take their activity while they are travelling. To fulfill that needs Coleman and Intext, two biggies of swimming pool tubs manufacturers, have come up with the above ground water pool for any season (winter or summer). Let’s see some of the things offered by these two manufacturers. While one can see what the difference in the products is, there is a lot of variance in the style and the design of manufacturability between these two companies. These above ground pool for winter and summer seasons has been one of the best-sellers for both the manufacturers. This is much more popular among the young people who would like to enjoy and have fun during their leisure times. Families have also been shown interest on the pools for their kids. People who couldn’t afford a whole bunch of space for constructing a swimming pool, pretty much prefer getting one of the Coleman or Intext pool for their homes. One of the biggest concerns people have when they are trying to construct a swimming pool in their house, would be the cost. But, both Coleman and Intex have eradicated this concept. The above ground pool for winter and summer seasons is one of the most affordable pools. The Intex pools pretty much depending on their different specifications, prices range between $250 to $600. Whereas the Coleman pools lies on the same range from $300 to $550, depending on what and what type of pool one wants. Unlike the traditional pool cleaning, where one must spend a lot of time on using the traditional way of cleaning the pool. The Robotic pool cleaner Dolphin premier cleaners are the new age cleaning technology one should be mindful of using it. These robotic cleaning cleaners are the new technology cleaners which doesn’t allow or doesn’t give the opportunity for people to clean the hot tub. It has the automatic feature, as the name suggest and on top of that, these Robotic pool cleaner-Dolphin premier cleaners are much more energy effective. According to the customer and consumer reviews, these take up almost 87% of the energy used, and not only gives a cleaner pool for their kids, but also makes sure that it is highly-energy efficient. The Robot has multiple filters and provided with dust bag, which cleans the whole tub or the pool within a few couple of minutes or an hour. With the top-notch engineering design and quality, the Robotic pool cleaner Dolphin premier cleaners are the new-age monsters for eradicating traditional cleaning. Thus, it can whether Coleman or Intex above ground pool, make sure you have got the right space and the safety precautions before installations. Of course, don’t forget to party hard whether it is for a pool party or don’t forget to play and when it comes to kids and family. Kids, you have less than 24 hours left to vote on Whit’s Amuse Bouche’s wedding amuse bouches. Just go there and do us all the favor! I’ll be picking the winner at 5 pm Central time tomorrow, and you’ll be winning French Fridays with Dorie, and the baked good from this blog of your choice! Now, everyone probably noticed what a flashback mood I’ve been in recently, what with the old school song quotes and the fruit roll ups, but I have been saving the most awesome flashback of all. See, I ate A LOT of junk food back in my day. When I say a lot, I mean like 99% processed, heavily marketed on television kind of junk. No shame, it is part of what has made me, me. But now, I don’t. Do NOT get me wrong, when I have had 1 too many red wine spritzers and I am outside of the Wiener Circle, you bet your tail I go in an get a charburger, but for the most part, I leave the process to the past and think fondly on my chubby youth. But something gets into me when I think about frosting in a plastic container. I don’t know. No, it’s not even that good but sweet Lord, did I love it! And I thought I was worldly, because dunkaroos, were so CLEARLY an Australian treat. Anyway, dunkaroos. I ate these things by the box. And I’ll be darned if I am going to have a life where my kids (completely hypothetical and currently not even a blip on the ultrasound- although HAPPENING like the Duggars someday) live without them. So, do me a solid and buy yourself a kangaroo cookie cutter, and head down under for a snack worth writing home about. Make the dough: Combine the flour, brown sugar, baking soda, and salt in the bowl of a food processor fitted with the steel blade or in the bowl of an electric mixer fitted with the paddle attachment. Pulse or mix on low to incorporate. It will be very soft and sticky. Lay out a large piece of plastic wrap and dust it lightly with flour, then turn the dough out onto it and pat it into a rectangle about 1-inch thick. Wrap it, then chill it until firm, about 2 hours or overnight. Roll out the crackers: Divide the dough in half and return one half to the refrigerator. Sift an even layer of flour onto the work surface and roll the dough into a long rectangle about 1/8 inch thick. The dough will be sticky, so flour as necessary. Trim the edges of the rectangle to 4 inches wide. Working with the shorter side of the rectangle parallel to the work surface, cut the strip every 4 1/2 inches to make 4 crackers. Adjust the oven rack to the upper and lower positions and preheat the oven to 350°F. Bake for 15 to 25 minutes, until browned and slightly firm to the touch, rotating the sheets halfway through to ensure even baking. slowly add the powdered sugar, add the milk and vanilla at the end to thin out. Finish with sprinkles. Also, you guys should know that in 2 days, Amuse Bouche will be participating in The Tomato Tarts online bake sale for Japan. We are selling our oreos, remember those? Well, I am just saying, you should probably bid for those.